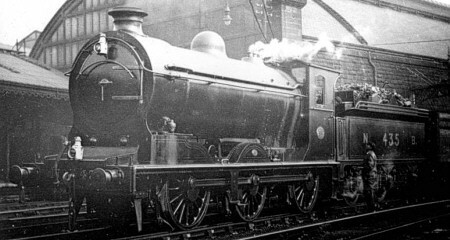 The Reid's Class B & S (LNER J37) locomotives marked the final development of the North British Railway (NBR) 0-6-0 freight locomotive. The J37 was essentially a superheated version of Reid's earlier J35, that also incorporated piston valves and larger 19.5in diameter cylinders. The piston valves had inside admission and they were actuated by rocking shafts. They were positioned above the cylinders, resulting in the boiler being pitched 6.5in higher and giving the J37s an imposing appearance. Production started with four batches of five built at Cowlairs in 1914-5. Large scale production started at the end of World War 1, with a large order of thirty four that was placed with the North British Locomotive Co. This was followed by fifty further locomotives built in five batches built between 1918 and 1921 by both makers. A total of 104 J37s were built. Two of the later batches built in 1919-20 had boilers that ran at 175 psi instead of 165 psi. These twenty locomotives were given the NBR classification of 'S'. There were a number of temporary upgrades from the 165psi 'B' engines to 'S'. Shortly after Grouping (1923), all of the J37s were up-rated to 180 psi and classed as 'S'. The first ten locomotives were built with Schmidt superheaters. The rest were built with Robinson superheaters. Boiler swaps often resulted in changes of superheater type, but eventually the entire class became fitted with Robinson superheaters. Replacement boilers were constructed from 1922 onwards. The first three were built with lock-up safety valves, but further boiler construction switched to the group standard of Ross pop safety valves. The exception was one batch of ten boilers built by Hunslet & Co. in 1947-8 which were fitted with the lock-up safety valves. In an attempt to improve the balance for long distance express goods services, between 1927 and 1938 various attempts were made to reduce the weight on the leading axle. An early attempt was to fit a balance weight to the dragbox, but this is thought to have resulted in excessive heating of the rear axle boxes. A satisfactory balance was eventually achieved. This resulted in a reduction of the weights on the front and rear axles, but an increase in the weight on the central axle to 21tons 4cwt. The J37s were introduced at a time when the NBR was experiencing heavy freight loads due to World War 1. They were initially allocated to long distance goods and mineral services on the NBR's main lines. By Grouping (1923), the J37s were allocated to Eastfield (29), St. Margaret's (23), Berwick (12), Dundee (11), Carlisle (9), Aberdeen (8), Thornton (5), Polmont (2), Parkhead (2), Dunfermline (1), Kipps (1), and Perth (1). Duties included through-workings to Newcastle, and beer trains from Duddingston to Forth Yard. Berwick's allocation was transferred to the North Eastern Area after Berwick shed closed in 1924. These engines usually worked from Tweedmouth, but they were occasionally allocated to Newcastle. No. 9454 was briefly allocated to Cambridge in 1926 when B12 No. 8526 was being trialed on the GNS Section. Despite the arrival of more powerful locomotives after Grouping, the J37s continued to haul main line services during the 1920s and 1930s. During the summer, they were also used for passenger excursions and occasional relief work. During World War Two, the North Eastern Area J37s were transferred back to Scotland. At about this time, many J37s were transferred to country depots. Aberdeen and Carlisle lost all their J37s, but Stirling and Bathgate both received them for the first time. All of the J37s survived to Nationalisation (1948). British Rail moved a number of them to ex-LMS sheds. These sheds usually used them for goods duties, and occasional passenger work to Carstairs. The J37s tended to suffer from hot big ends when operating on the ex-LMS routes - something that had not been a problem on their LNER duties. By this time, the NB section was primarily using the J37s for local mineral work, although they did see occasional passenger work during the 1950s. Withdrawals started in 1959 and were initially slow. Thirteen remained in service in June 1966 operating short distance goods and coal trains in the Lowlands and Fife. All were withdrawn by 1967. Heating Surface: Total: 1419.72 sq.ft. None of the J37s survived into preservation. Falcon Brassworks sell a 4mm scale (OO gauge) etched kit of the J37. NB Models have also produced a whitemetal 4mm scale kit, but this is no longer available. Both Connoisseur Models and Redcraft sell kits of the J37 for 7mm scale (O gauge). Thank you to Malcolm Peirson for the photograph of NBR No. 435.